Greatmen Cottage is a large, open, sunny 3 bedroom, 2 bathroom Creole Cottage built in 1838 in the Bywater - NOLA's hottest neighborhood. Greatmen Cottage was created to be a magnet for interesting people who enjoy life. It is available as a Vacation Rental & as a Filming Location. It has been completely renovated, updated and professionally decorated and landscaped. This home is very spacious at 2,000 square feet. It has open views and access to an enormous, very private side yard and back yard that feature extensive brick terraces and beautiful plantings. If you need just two bedrooms you should check out our sister property - VRBO 810294. On the first floor, this sunny, spacious home features a large foyer, enormous living room (14 x 25), dining room (14 x 14) with French doors leading to the side yard, a huge cook's kitchen (12 x 25) featuring a professional grade Jade range, side by side refrigerator/freezer, custom glass cabinetry, a large island with double under-mount sinks, and extensive copper countertops. Off the kitchen, there is a glass sunroom featuring enormous floor-to-ceiling windows and a brick floor. This brick floor continues into the downstairs bathroom that features a large stall shower with white subway tile walls and a cascade shower head. Upstairs features three large, private bedrooms, each with a queen bed and generous closet. There is also a large linen closet and a separate laundry closet featuring a stacked full-size front-loading washer and dryer. Upstairs also features an innovative double bathroom, which allows one person to use the toilet in private while another person uses the shower in private. The shower room features two side-by-side pedestal sinks with medicine chests. The large stall shower sports a solid glass door, marble floor and white subway tile walls. Like the downstairs shower, it features a cascade shower head. The toilet room features a toilet, a large closet with ample shelves for toiletries and a third pedestal sink with a large mirror. This house is situated in the Bywater – the trendy, hipster neighborhood that's just five minutes downriver from the French Quarter. Food & Wine Magazine calls the Bywater 'New Orleans Hottest Neighborhood.' http://bit.ly/1f9nD0V Artists and musicians relocated to Bywater when the French Quarter became too pricey. Now joined by professionals and young families, its high elevation has allowed it to thrive post Katrina as it never flooded. The Bywater along with neighboring Faubourg Marigny are historic districts listed on the National Register of Historic Places. They are two of the most colorful neighborhoods in New Orleans. The Architectural styles borrow heavily from the colonial French and Spanish and have elements of the Caribbean. This unique blending of architectural elements over the last three centuries has resulted in an architectural style unique to the city of New Orleans. There are many incredible restaurants, hip bars, lively pubs and art galleries scattered throughout the neighborhood. Like Satsuma Cafe & Coffee House – it’s a favorite breakfast and lunch joint featuring some of the freshest and most innovative choices in town – like their sweet potato pancakes – the tattooed and pierced wait staff really know how to cook. Oxalis is a whiskey focused bar that is also an amazing restaurant. Food includes Korean bo ssam (pork belly, mushrooms or shrimp served). There are also chicken wings, a amazing burger, steak frites and duck confit. In addition to the restaurant there is a great back bar with a fireplace. Elizabeth’s restaurant is very popular for breakfast, lunch and brunch - their praline bacon is a cross between praline candy and salty pork, truly amazing and not to be missed. Mariza is another great restaurant. It's in the Rice Mill Lofts on the corner of Chartres Street & Press Street just a 10 minute walk from our house. It’s a beautiful hip space with an Italian influenced menu - incredibly fresh and delicious. There is an amazing local pizza place right around the corner from our house called Pizza Delicious. Amazingly great pizza, voted Best in New Orleans for the past several years. Their Peppadew & Arugula Pizza is my favorite. It’s a quick three-block walk from the house. Euclid Records is a vinyl music store with a funky ambiance – it has a huge selection specializing in jazz, soul and New Orleans music. It’s next to Pizza Delicious. They also do live music events from time to time. The Joint is a great BBQ restaurant on the Corner of Royal Street & Mazant Street, 7 blocks from our house, an 8 minute walk. Amazing ribs, chicken and pulled pork. Great sides. And the Peanut Butter Pie is hard to resist for dessert. Great homemade iced tea & lemonade and also a full bar. Lots of tables and a bar inside. The Country Club (just a quick five minute walk from our house) is an elegant retreat that offers a lushly landscaped saltwater pool, a hot tub & a sauna. Plus an amazing restaurant with two bars (one inside & one outside). It’s the perfect setting for a relaxing afternoon – memorable meals, poolside cocktails, poolside dining and the friendliest staff in town. Saints and LSU games are screened on a 25-foot projector at the pool. Saturday Drag Brunch features a bottomless mimosa and a build-your-own Bloody Mary bar with 50 ingredients. The Drag Brunch is especially popular with women for Bachelorette Parties - make your reservation at least one month in advance. Thursday night in Bywater is the night to go to Vaughan’s Lounge as it is Kermit Ruffins's night. Go early and get some of the barbecue Kermit is often cooking up before a show. Another popular place for dinner and music seven nights a week is Bacchanal, a funky wine shop on Poland Street. Here a cast of rotating chefs turns Bacchanal’s back courtyard into a food destination by showcasing their multicultural cooking. Guests sit at picnic tables and enjoy the great food, fine wine and top-notch live music. The historic renovation business is also booming in the Bywater. Attracted by the neighborhood’s gorgeous architecture and “high and dry” elevation, many projects are already completed or underway. World-renowned architect Andres Duany recently completed his Bywater Cottages – four newly built, hurricane-resistant houses designed to blend perfectly with the neighborhood. “Ninety percent of Bywater’s architecture is gorgeous and historic; my new Bywater Cottages harmonize perfectly with that centuries-old architecture,” said Duany. In addition to the park, I also like walking to the French Quarter via the charming streets of the Bywater & Marigny. The Orientation Guide I will provide to you details my favorite walking route. 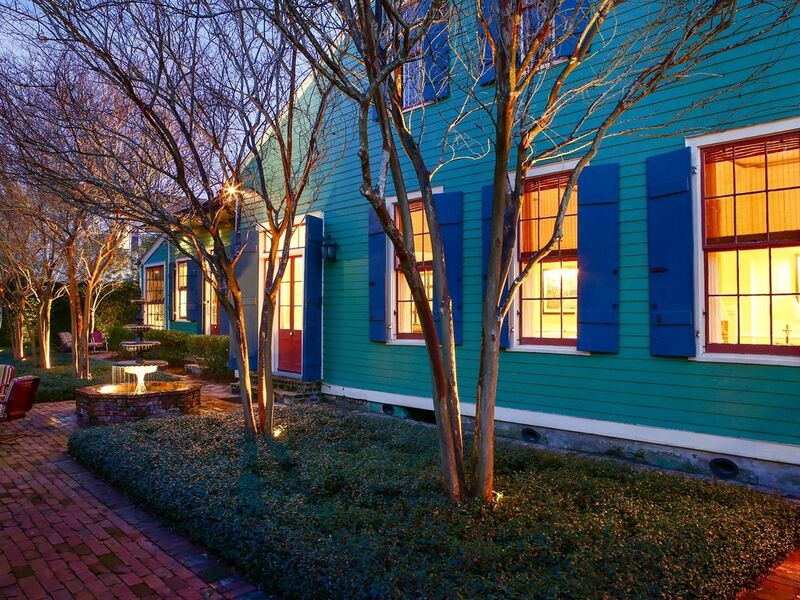 It is a charming walk through an historic district with lovely homes. You will pass a restaurant or a charming shop on just about every block. The Desire Streetcar will one day return to replace what is currently 'A Bus Named Desire' which stops near our house 15 times a day on its five minute route between the French Quarter and the Bywater. Cab fare & Uber fare between the French Quarter and Bywater runs about $7 and the trip takes less than five minutes. Very simple and very cheap. Many guests at our house like to rent bicycles at Bicycle Michael's on Frenchmen Street. If you plan to drive your own car or rent a car, there is ample street parking in front of our house at all times for up to two cars. Uber is also readily available from our home - it's quick, convenient and very affordable. 1. We require the Renter to review, complete and sign a lease agreement when they reserve our home. 2. Usage of the premises (house & property) is limited to six people. Please have a great time and enjoy yourselves. However, you may NOT host events in the house, in the yard or on terrace where you invite outside guests. Our insurance does not cover that kind of activity. Also, these kinds of events bring complaints from the neighbors regarding noise and parking. 3. We do not allow folks to blast music in the house at any time. Quiet hours inside the house run from 12 Midnight - 8AM. 4. We do not allow folks to play music on the terrace at any time. As a courtesy to our neighbors, we have quiet hours on the terrace between 9PM and 9AM. 6. No smoking in the house. 7. No crawfish cooking - either inside or outside the house. Although delicious, they can leave a stench that takes days to clear – so it’s not fair to subsequent guests. english, Google Translate for other languages. Greatmen Cottage is an historic 3 bedroom, 2 bathroom Creole Cottage built in 1838. It was completely renovated, updated and professionally decorated and landscaped. This home is a spacious 2,000 square feet. It has open views and access to an enormous, very private side yard and back yard that features extensive brick terraces and beautiful plantings. Available as both a Vacation Rental & as a Filming Location. Luxurious & Beautiful. ATTENTION MILITARY – We can accommodate the Joint Travel Regulations payment terms for Uniformed Service Members and DOD Civilian Employees traveling on business. toilet, shower, Gorgeous shower, three pedestal sinks and one toilet. toilet, shower, Gorgeous shower and toilet. This house has two beautiful, designer bathrooms. Upstairs features an innovative double bathroom, which allows one person to use the toilet in private while another person uses the shower in private. The shower room features two side-by-side pedestal sinks with medicine chests. The large shower sports a solid glass door, marble floor and white subway tile walls. The shower features a cascade shower head. The toilet room features a toilet and a large pedestal sink - this room has a door to the hallway and a second door which adjoins the shower room with the other two pedestal sinks. The downstairs bathroom features a toilet and a enormous shower with white subway tile walls and a cascade shower head. Sheets, pillows, pillow cases, blankets, and duvets are provided. There is plenty of street parking in front of the house at all times. Enormous 25' x 14' living room with great view of the gardens and side yard. Beautiful stainless steel professional grade range and oven. Beautiful stainless steel microwave oven. One drip coffee maker and one French Press. Great round dining room table seats 6 comfortably. Stunning view of fountain, pergola and garden from dining room table through French Doors to side yard. Flat Screen TV in the Living Room. Great sound system that allows you to plug in your iPod to play your own music through the system. There are speakers in both the living room and the kitchen. The stereo system has an adaptor so you can plug in your iPod and play your own music. This property is available as a Vacation Rental & as a Filming Location. Professionally decorated house, large outdoor terrace professionally landscaped. However, we do not allow parking on the terrace. We DO NOT allow parties/receptions/weddings/ rehearsal dinners, etc to be hosted on the premises. No crawfish boils are allowed in the yard or in the house. ATTENTION MILITARY – We can accommodate the Joint Travel Regulations payment terms for Uniformed Service Members and DOD Civilian Employees traveling on business. The cottage was way beyond our expectations! Beautiful decor, comfortable but elegant, well equipped with everything you could possibly need. Terrific neighborhood, we walked into the French Quarter a number of times, along Crescent Park. Though plenty to do closer by. Private, huge out door space with fountain, makes you feel like you are saying in a hotel. Not one thing I would change. James was an incredibly thorough and attentive host. He truly thought of everything. He left plenty of material to answer all our questions and responded immediately whenever we needed something. His house is phenomenal. Everything was beautiful and clean and worked well. Would highly recommend staying at Greatmen Cottage. Perfect distance from the quarter while still having a quiet, beautiful, high quality home to come back to. Plenty of towels and sheets and very comfortable beds as well. Jim was great about sending out all the information we needed for our stay in NOLA. The home was even better than the description, with lovely decorative touches that made the home feel very comfortable. The Greatmen Cottage is a beautiful home! A must stay here! The Greatmen Cottage is a beautiful home! The interior design, courtyard and amenities make this a warm; do not want to leave experience. All of the spaces are fantastic, but our favorites were the kitchen and the living room, picture and function perfect. The owner was excellent to work with and very responsive. He provided us with a detailed instruction book for the property and a booklet on favorites spots of New Orleans. The home instruction book was the best I had ever read, nothing was left to chance for the visitor to cope with an unknown house feature. When I return to New Orleans, this is where I will stay again and again! Really cute place, nice and clean, plenty of linens and bathroom accoutrements provided. Prepare yourself to climb very steep stairs, as all of the bedrooms are on the second floor. One full bath upstairs with separate toilet and sink. Another full bath is downstairs. The kitchen is amazing and so is the courtyard. We really loved the fountain and motion-controlled lights! We didn't really understand the reason for not playing music outside at any time, even during legal time points. I mean, it is New Orleans. However, we would definitely stay here again and appreciate the hospitality. There were two different bus lines available only 2 blocks away in either direction, making it easy to get into the French Quarter..
Our home is 5 minutes from the French Quarter and 13 minutes from the Convention Center. If you don't have a car or don't want to drive, the most convenient option is Uber or a cab. Very simple and very cheap. The trip from our house to the French Quarter costs $7 and the trip to the Convention Center costs $12. Another option is to use the New Orleans bus service which stops near our house. Below is a link to the current bus schedule. The bus fare is $1.25 per ride. Or you can get an unlimited ride Jazzy Pass for $3.00 for one day or $9.00 for three days. Our home is 15 blocks from the French Quarter. The best way to walk it is along the new riverfront park called Crescent Park which offers a great view of the Mississippi River the whole way. The walk to the French Quarter from our house takes 20 minutes. This park opened in February 2014 and currently runs from Mazant Street to Spain Street. The final three blocks that connect the park to the French Quarter will open in 2015. The second best way to walk is along the charming streets of the Bywater & the Faubourg Marigny. In my guide book I recommend my favorite walking route. On this route, you will pass a lovely restaurant or a charming shop on pretty much every block of your walk from my home to the French Quarter. ATTENTION MILITARY – We can accommodate the Joint Travel Regulations payment terms for Uniformed Service Members and DOD Civilian Employees traveling on business. Taxes are included in the rate. Rates are subject to change until you have a signed lease agreement. ATTENTION MILITARY – We can accommodate the Joint Travel Regulations payment terms for Uniformed Service Members and DOD Civilian Employees traveling on business.